Don't "Assume" the Bible Says! It is the great paradox of the twentieth century. On the one hand, man has made incredible progress, in science, in technology, in engineering. He has developed the computer, harnessed the power of the atom, walked in space and on the moon, and sent spacecraft to probe the far reaches of the solar system and beyond. And yet, in spite of great material progress, much of the world still lives in poverty and squalor. Millions must daily face the threat of famine. Children are ravaged with disease and malnutrition, and whole populations are torn apart by the horror and brutality of endless wars. Why, when there seems to be no end to man's inventive genius, can't he solve the problems of living together in peace and prosperity? Typical of this paradox is the island nation of Sri Lanka, set in the Indian Ocean off the southern tip of India. Blessed with a tropical climate, beautiful scenery, abundant natural resources, and not overpopulated, Sri Lanka seems in a good position to avoid the problems that beset other nations in this region. In the last ten years, Sri Lanka has made great strides in material development. But the calm was shattered as rival factions took to the streets in outbreaks of terrorism and violence that rocked the entire nation. As I mentioned on a previous program, on my recent visit to the Far East, among several other countries, I visited Sri Lanka, the island country just off the southern tip of India. And while there, I found that the same conditions attain there that do all around the world, the same paradox, and in fact, they were, at the moment I was there, in the throes of a fresh wave of terrorism that was occupying the banner headlines of newspapers. While there, I not only visited with the president of the country, but with most of the top officials of the nation, and also before leaving, I spoke to a local audience of subscribers to The Plain Truth magazine. The Plain Truth is one of the largest-circulated magazines in the world, as I will mention again at the close of this program. But I want to show you some of the things that I said in that meeting to our own Plain Truth subscribers in Sri Lanka. At the presidential palace in Colombo, Mr. Armstrong met with Sri Lanka's head of state, President J. R. Jayewardene. After presenting the president with the traditional gift of Steuben crystal, Mr. Armstrong discussed the problems that a leader of a nation today faces in trying to help his people. Sri Lanka's national state assembly buildings are set on a lake in the outskirts of the capital city. The striking, modern buildings are inspired by the traditional architecture of Sri Lanka. The parliamentary complex forms the nucleus of a new administration capital for the country. At the parliament building, Mr. Armstrong met with Sri Lanka's prime minister, Mr. Ranasinghe Premadasa. "Thank you." — 'It's a pleasure that I have this opportunity of meeting you.' — "Thank you so much." — 'I've read a lot about you, and I've read The Plain Truth, oh yes.' — "Thank you, well, it's an honor to meet you." — 'I've read a lot of copies.' — "Thank you." Mr. Armstrong explained why the Ambassador Foundation cooperates with governments and international organizations in undertaking projects in the interest of world peace and understanding. I thank so many of you for coming out now this afternoon, and for subscribing to The Plain Truth and reading it. You're a part of more than seven and half million subscribers, and perhaps as many as twenty or thirty million people reading The Plain Truth all around the world. Now this world today is in trouble, and the evils are getting worse and worse. Now we've had wars ever since humanity has been on this Earth. And finally, it's come down to the place where we have had two world wars. And since the last world war, we're having little wars break out here and there, and strife in many parts of the world: strife in the Middle East, strife between England and Ireland, strife down in Central America, strife all over the world. And we've come into even different kinds of warfare, and the latest thing now is terrorism, and you're having a taste of it even here in Sri Lanka. And so you've had a curfew. And why are we having trouble like that? Many people have called me an unofficial ambassador for world peace, and I had a press meeting in this hotel in another room, a couple or three days ago, and some of the press reporters there asked me why I couldn't just bring world peace right away. Well now, I didn't come here to just wave a magic wand and "Hocus-pocus, you've got world peace." I can't produce peace like that. It takes something to cause peace, and there has to be a cause for all of the troubles. There is a cause and a reason why we don't have peace. And we will have never have peace until we eliminate the cause of trouble, the cause of wars, the cause of violence, the cause of terrorism. Why do we have things like that? Now I have said you can sum up the whole cause of all of the trouble in two words: human nature. But how did we get human nature, and where did human nature come from, and how did it start? I said before a press conference that peace is not going to come until this world learns a lesson. We do not live the way that would produce peace. If we lived according to the right way of life, the way of loving your neighbor as much as you love yourself, we would all have peace. But people don't live like that. The problems in this world have become so great, that no man in any government can solve them. I've talked to heads of government, to kings and prime ministers, and presidents and heads of government all over the world, and I had lunch even just this noon with your president, and they are capable men who will run governments all over the world, but no human being is capable of solving all of these problems. Now why? This world has been allotted 6,000 years of human experience to go on and learn the lesson that selfishness, and trying to get from other people, and competition and strife is not the way toward peace, and is not the way toward happiness, and is not the way to have prosperity and the good things that can be produced out of the Earth, because all material things come out of the Earth. Now I'll go back to the beginning. There was a time when there was no human being on this Earth. And the oldest history in the world is called the Bible. There's another history that is known in this part of the world called the Koran, and it also records the same incident. They are the oldest histories that you can read to find out what has happened way back in the past. Now both the Bible and the Koran give us a recorded history of the very first man. The first man was created "out of the dust of the ground." In the Koran, it says "out of mud." In the Bible, it says "the dust of the ground." It's all the same thing. "By God." And man is just out of the dust of the ground, he breathed into his nostrils the breath of life, and man became a soul. And to that soul, there was a forbidden tree in the great garden where the man was placed, and God told him he must not touch of that tree. Now there was another tree in that garden called the Tree of Life, and he could have had that tree, and God wanted him to take of that tree, but that would have meant that he would have relied on God, that God would teach him, and God would show him the way to live to have peace. God would show him how to love his neighbor. The other tree meant he would decide for himself what is good and what is evil, and he would take the knowledge to himself of what is good and evil, and that is what the man did, and he disobeyed God. And thereupon, God shut up the tree of life, and shut it off from man for 6,000 years, and it's still shut off up to this day. The world doesn't know that, but it is true, and that is the condition. Now the man was left to himself. He rejected relying on God. He said, "I will rely on myself. I will think out myself what is good and what is evil. I will think out for myself what causes pain and suffering and the way to avoid it. I will think out for myself what is good." Now along that same time, before that, the creator God had created angels. After God created angels, he created one very great superangel; he was a cherub. He created three kinds of angels: ordinary angels, and then angels that are called seraphs, that are a higher grade of angels with greater minds and greater power, and then still higher, angels that are called cherubs, and they are still higher. Now, most angels are holy, and righteous, and good, but just like the man had to decide for himself whether he would listen to his creator and rely on his creator or just rely on himself and disobey his creator, so this one archangel did. He was placed on this Earth. His name was Lucifer, and he was placed on the Earth and given the throne. Now he's an angel. He's a superangel of great power, great mind, but his mind became perverted and warped, because he disobeyed God. And where God says that you shall love one another, he said you shall hate one another. He believed just the opposite of God. Where God is good, he became evil. Now he influenced the first man and the first woman, before they took of that tree of the knowledge of good and evil. And he has been ruling over mankind ever since, and there are evil spirits ruling in this world, and many religions believe that there are different spirits, and they think that they are gods. They are not God. There's just the one God family, and God is a family. There is a father of that family, and the one who became Jesus Christ was the son. But God is supreme over all. Now until you understand that, you can never understand the great mystery of life, and why we have trouble in the world, and why things are like they are. They'll never make sense to you until you understand this. Now human beings have gone along in the way of selfishness and deciding for themselves what is right and what is wrong, and they have not relied on God. They've tried to rely on themselves, and they're cut off from God, and they don't even know about God. They don't think about God. Now God is love, and he loves us all. He loves everybody, and he wants us to learn to love everybody, and he wants us to know that we need to rely on him, and that his mind alone can understand our problems, and he can show us the way to peace, but people don't turn to God. They don't say to God, "Show me your way." They don't say to God, "I know I've been wrong, and show me how to get right." No, they want to go on their own way. God did not create human nature in us, we turned to that way until it got to be habit, and got to be natural, and so we call it human nature. And that's the way we are on the Earth today. And we have our problems, but our minds aren't big enough to understand all of our problems, and to understand that as long as we're selfish, and as long as the whole motivation of life, the purpose of life of most people is just to compete, competition, trying to get, trying to get something for themselves. And everyone wants more of material things that come out of the ground, and we need to think about the spiritual things which is the me in one mind with another mind, in love and in peace, and in happiness. We don't have peace, because people don't have peace in their own minds and hearts. They just don't have peace in their hearts or in their minds. And until people have peace in their minds and hearts, and all of the people have peace, we won't have peace. Now after 4,000 years of human life on Earth, God sent another man that was his own son, the one that had been the Logos, that was the very family of God, as the very son of God, and he became a human being, and his name was Jesus Christ. The what-is-called the Christian religion is supposed to be the religion he started, but it is not, because what he preached was something different. And other people have taken a different kind of religion, and put his name on it, and they call it Christianity, but it is not the real, true Christianity, because they do not follow the teaching of Christ. They do not believe what Christ said. Christ said he came to be a king, and they deny that. Christ said he came to rule, and he will rule. But he didn't come to rule at that time. He came in love, because he loved people. And people who did not love him, but hated him, had him killed. And he died for them, and God raised him from the dead, and he ascended to heaven. And in due time, when the 6,000 years is up, God is going to send him back in supreme power and in glory, and he is going to rule over all the nations on the face of this Earth! But he won't do that until human beings have come to the place where is he delayed, any longer, human beings would wipe themselves out of existence by nuclear weapons. And God is not going to let us commit human suicide by erasing ourselves from the Earth. He will intervene before we go that far, after we have learned we're so helpless we can't solve our own problems. We can't solve our problems. We have to rely on God. We can't save ourselves, because we aren't willing to love one another, because we go on and humans want to compete with one another. And as long as we want to live that way, we will not have peace. Now, you can't just pray to God: "Give us peace," and he'll give you peace. God says, "You live the way I tell you, and you'll have peace." I'm living that way; you can live that way if you want to. And we'll help you. But I didn't come here to try to force any of it on you. I'm just talking plain language. I've told you where the trouble is, I've told you why we're having trouble. I've told you how we're going to have peace; it won't be in this world, it'll be another world altogether. And God is going to have to take over and start new government, new organization, based on love and cooperation and helping one another, and on generosity and giving instead of on selfishness and competition and strife and jealousy and envy and hostility. We have to get hostility out of our minds and hearts, and get love into our minds and hearts to want to help other people. So I leave that with you, and hope that you will continue to read The Plain Truth. And now, before I go off the air, I want to again mention to you a special booklet that has just recently come off the press, a very absorbing booklet, A World Held Captive. You have never read anything quite like it. There you'll find the world behind bars, A World Held Captive. 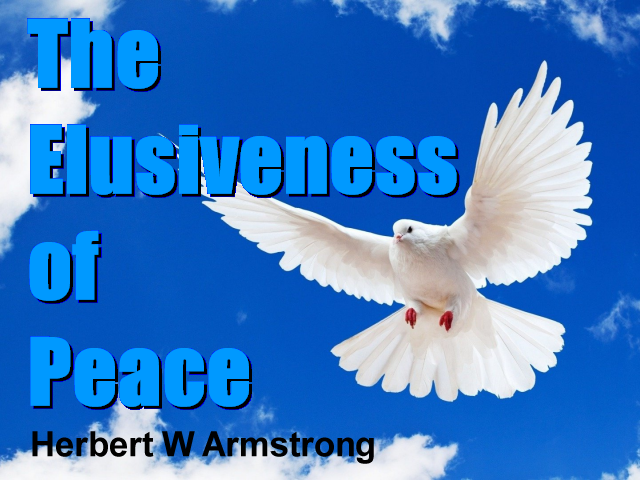 It explains this paradox that is going on all over the world, the causes of it, and how we're going to have peace, a lot more explicitly than I could in the program that you have just heard. Also, let me mention once again the Plain Truth magazine, and let me mention the booklet is absolutely free. The Plain Truth is also free, there's no subscription price. I spoke to many Plain Truth readers in Sri Lanka. You may have a year's subscription if you wish it, and it is absolutely free. You don't have enough money to buy a year's subscription. There is no follow-up of any kind, no request for money. The Plain Truth is one of the largest circulated magazines in the world, with more than seven and a half million subscribers. It begins with an editorial written by me: What's Wrong With the Business and Industry? What's Wrong With Business and Industry? A second article: The Truth Behind America's Moral Crisis. Then a third article that is in this recent copy of The Plain Truth: The Family - God's Plan for Mankind. Very few realize to what extent the family is an integral part of God's plan for mankind and the importance of the family structure. Another article: What's Prophesied for Russia and China? What is going to happen? The Plain Truth is a news magazine, but it makes clear and understandable the meaning of the news that you're reading in your newspapers or hearing in newscasts regularly. There's no other place where you can get a real comprehension and understand the meaning of what's going on in the world, like The Plain Truth. There's no magazine like The Plain Truth. It is a family-oriented magazine, and it deals with the human interest and the problems of life, the things that confront every one of you in your lives every day. For your free subscription to The Plain Truth, if you're not already a subscriber, and for your copy of the booklet A World Held Captive, just send your request to me, Herbert W. Armstrong, at Pasadena, California. That's Herbert W. Armstrong, Pasadena, California, 91123. But better yet, just go to the telephone right now. Call now. A free call — you dial 800-423-4444. That's area code 800, then 423-4444. Jot that number down. If the line is busy, call again in 5, 10, or 15 minutes, and keep calling till you get through, because thousands upon thousands of calls are coming through right now. Go now to the telephone. So until next time, this is Herbert W. Armstrong. Goodbye, friends.